Via Amsterdam is a strikingly decorated budget ho(s)tel with awesome amenities, including a kitchenette, laundry room, 24-hour reception, and a “travel shop.” Its location in a 1990s-era office building within a still-operating business park provided the inspiration for the ho(s)tel's 90’s theme. The colorful motif can be found throughout, from funky illustrations of boom boxes, tape cassettes and brick-sized mobile phones in the elevators to a Pacman lamp in the kitchenette and rainbow-hued graffiti in the hotel restaurant. YOU SHOULD KNOW The location, which is technically not even in Amsterdam, but just outside the municipal city limits, could be an issue for some. Still, it bears remembering that Amsterdam is a tiny city compared to large metropolises like New York and London, and a hop on the nearby metro gets you to the city center within 20 minutes. Boasting some 170 minimally decorated private guest rooms and dorms (including all-female ones) with a total of 744 beds, Via Amsterdam certainly isn’t short on space. Dorms have steel bunk beds with integrated plugs and USB portals (so handy!) and large numbered lockers (bed linens are included). Amenities include super-fast WiFi and premium mattresses. Bright yet minimalist twin rooms feature comfy beds, bedside lamps made from old Bakelite phones, LG flat-screen TVs, medium-sized closets and small desks.energy you need for the energetic city life. Take advantage of the kitchenette to cook your meals and the laundry room to wash your clothes. Very cool! All rooms−even the dorms−have en-suites. The smart white communal bathrooms feature diagonally placed white tiles with contrasting grout in the color of an accent wall (tomato red, say, or bright green), along with small overhead showers, simple sinks, and wall-mounted toilets. The twin rooms offer petite private bathrooms with adjustable rain showers and CosmEthics bathroom products, in addition to simple sinks and toilets. A bright yellow reception desk and bold black-and-white street art in the lobby form a compelling contrast with exposed concrete beams. 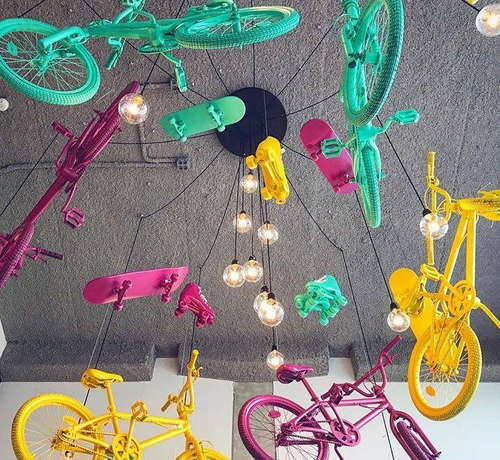 Look up and you’ll notice a funky lamp with BMX bikes, skateboards and rollerskates painted yellow, pink, and green. Bar/restaurant The Dude−named after Jeff Bridges’ character in the 90’s film “The Big Lebowski”−offers hamburgers, healthy poke bowls, hot dogs and falafel salads to an eclectic clientele that may include backpackers, office workers from the surrounding business park, and students from the nearby Campus Diemen Zuid. An affordable Continental breakfast is offered for only €6.50 but you can order a la carte too. Order “The Dude,” a 160 gram beef burger with bacon, Old Amsterdam cheese, fried onions, and pickles. It’s delicious! Bar/restaurant The Dude also has Dutch craft beers and cocktails. Bored? There are also a cinema room and various social spaces with a weekly roster of events, such as “The Big Lebowski bowling nights”, R&B parties, pop-up dinners and Netflix marathons. YOU SHOULD KNOW There’s a sunny 80 -quare meter outside terrace but unfortunately it overlooks a parking lot. 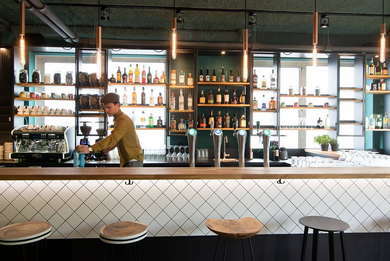 Located on the border of Amsterdam and Diemen, this budget hotel is not by any means central if you’re in town to do some traditional sight-seeing, but very well situated if you’re up for a football match or concert. Metro access is available at nearby Venserpolder (7-minute walk) and Diemen-Zuid (an 11-minute walk along a safer route, especially at night). You can also act like a local and rent a bike (€17.50 per day) or bring your car (parking is €20 per day). Stay put, there are no decent restaurants in the area, but if you hop on the metro, the following spots are all a short walk away from Waterlooplein station: Warm up with Café Bern’s deeply filling (and affordable) fondue (2-minute walk). For cheap-and-cheerful Israeli food, you can’t go wrong at Hummus House (5-minute walk), where you’ll find housemade hummus served with warm pita bread and plenty of pickles and sauces. Craving some comfort of the Cantonese kind? Head straight for Chinatown, where Nam Kee (3-minute walk) is an old locals’ favorite. If you’re tired, stick to The Dude, because there are no decent bars in the area, but if you hop on the metro, you’ll find plenty of places near Waterlooplein station: Amsterdam’s famous cannabis coffee shop The Bulldog is an easy 6-minute walk. Or if it’s old world charm you’re after, Café de Sluyswacht (4-minute walk) has been around since 1695 when it was a lock keeper’s cottage. Today, it offers pretty views of Oude Schans canal, local beer, and bitterballen (a typical Amsterdam bar snack). Via Amsterdam is a fantastic budget ho(s)tel for savvy travelers who value fun design and excellent amenities over a central location.